Illustrated with a sensitivity and humor that have made him beloved by his audiences, Mort Gerberg's work has been featured in major publications, including the New Yorker and Saturday Review. Throughout his career Gerberg’s work has been drawn from subjects ranging from social consciousness to music and sports. Known for combining artistry with intuitive wit, he chronicles and comments on contemporary events that become history. The more than 120 published cartoons, drawings, and sketch reportage featured in the exhibition cover a wide range of topics, such as life in New York City, women’s rights, old age, and politics. Curated by Marilyn Satin Kushner, curator and head, Department of Prints, Photographs, and Architectural Collections. Fantagraphics Underground is publishing a new book, Mort Gerberg On the Scene: A 50-Year Cartoon Chronicle, in conjunction with the exhibition. Copies of the book and Mort Gerberg's other publications, as well as notecards, mugs, and other gifts featuring his work are available from the NYHistory Store. Special signed prints are available from Uncommon Goods. Generous support for this exhibition provided by The Field Family Foundation. 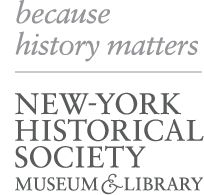 Exhibitions at New-York Historical are made possible by Dr. Agnes Hsu-Tang and Oscar Tang, the Saunders Trust for American History, the Seymour Neuman Endowed Fund, and New York State Council on the Arts with the support of Governor Andrew Cuomo and the New York State Legislature. WNET is the media sponsor.